MOTAT Auckland is New Zealand’s Museum of Transport and Technology, a shining example of Kiwi ingenuity. 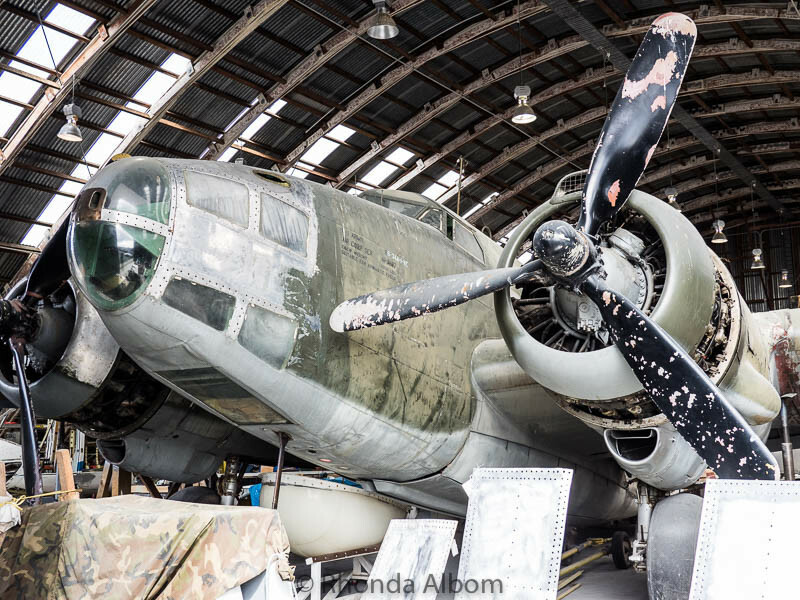 It’s a family-friendly museum with interesting technological and aviation displays that offer fascinating insights through the 150+ years of NZ history. For kids, MOTAT offers hands-on, interactive displays that target multiple levels of understanding, making it suitable for all ages. Younger children have fun while discovering relationships and reactions, while older children can get in-depth knowledge of various technological advances. Adults can follow the transformation of technology even within our own lifetime, albeit a bit surreal when I saw items that I used as a child on display. 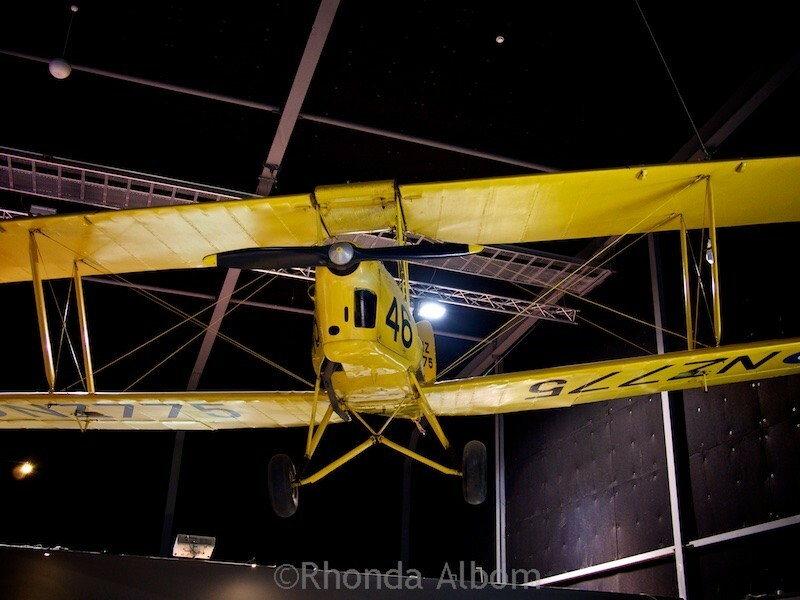 9 Have you been to MOTAT Auckland? 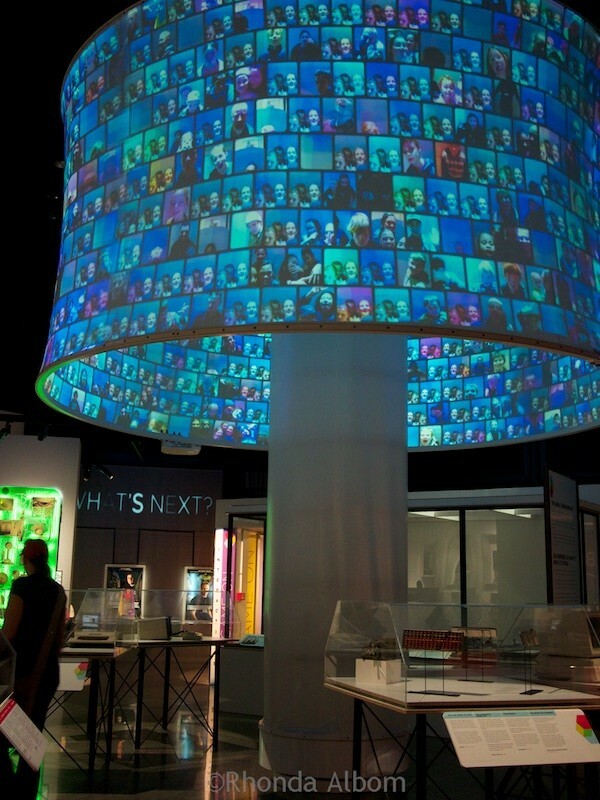 Do you prefer interactive or visual museums? This original Western Springs pump house was the first reliable source of water for the city of Auckland. 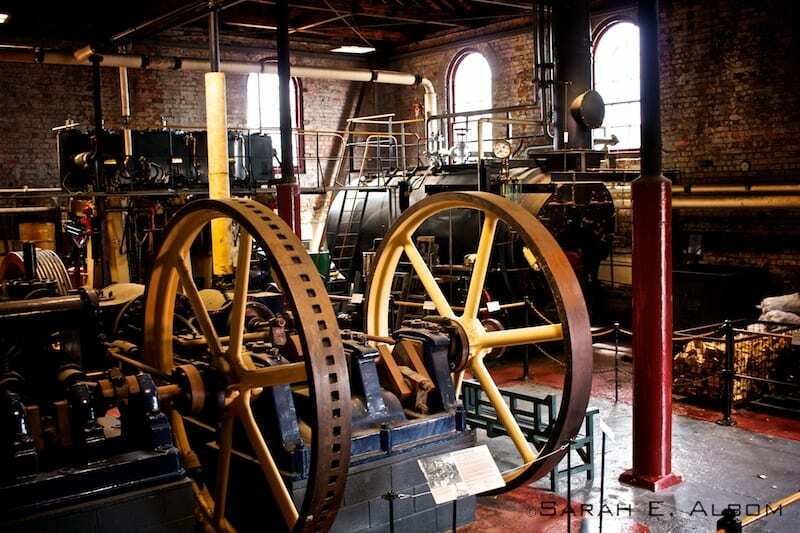 On special days, they fire up the steam boiler and run the engines. It is the first pump house in New Zealand to receive a UNESCO award. An inside look at the steam house that drives the pump room. 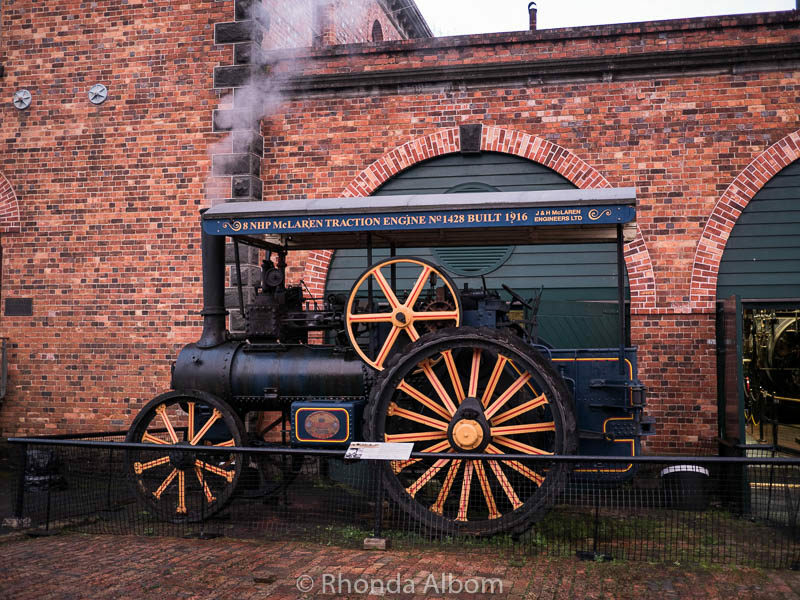 A working steam traction engine sits outside the pump room. The main section of MOTAT focuses on transportation and technology. Hands-on exhibits foster learning, while kids think they are just having fun. The museum has both indoor and outdoor sections. It is located in several buildings spread out around the complex, so keep the weather in mind when you dress for the day. Many of the exhibits are fixed and there for years, while others like the special Da Vinci Machines display are on tour for a limited time. One of many old tram cars formerly used in New Zealand. 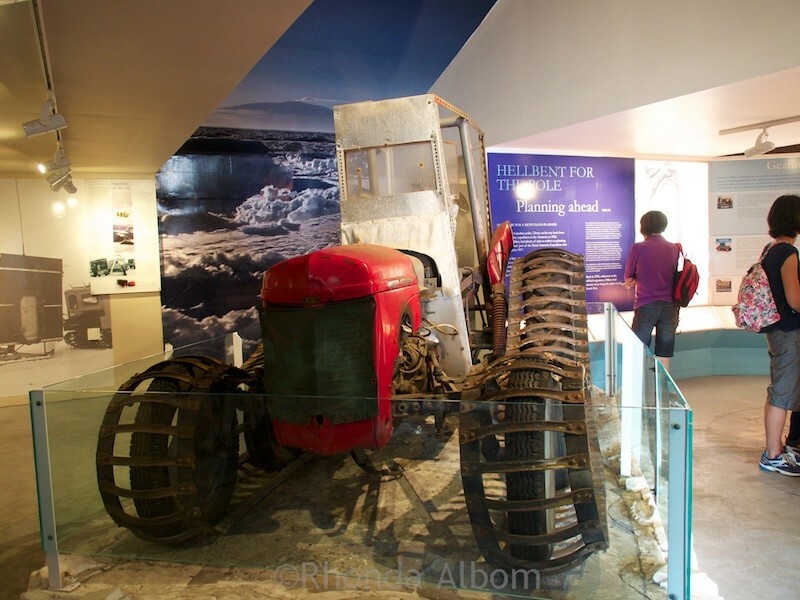 A tractor to go over the Antarctic ice in “90° South” where visitors explore Sir Edmund Hillary’s Antarctic Expedition. “Get Smart” is an interactive exhibit highlighting the advance of electrical technology since the late 1800s. Here we enjoyed a selfies camera that later projects our images up on this giant display. Do not speak in Maori! Do not write with your left hand! The historic village fits into MOTAT as it represents the technology of the pre-electric time period. 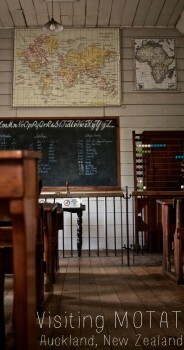 Inside the one-room schoolhouse from the 1800s (retrofitted with the lightbulb). A row of early 1900’s shops. 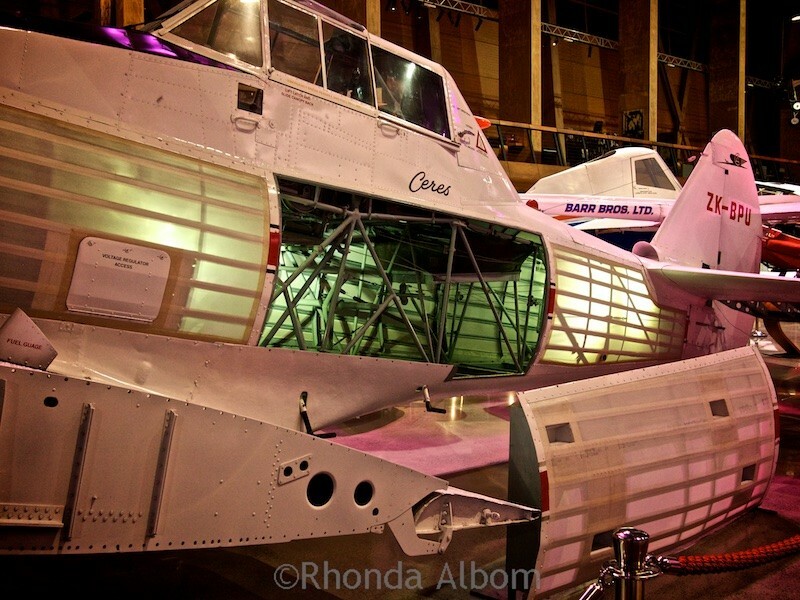 MOTAT Aviation Hall is about 2.5 km from the main museum, and worth a visit. 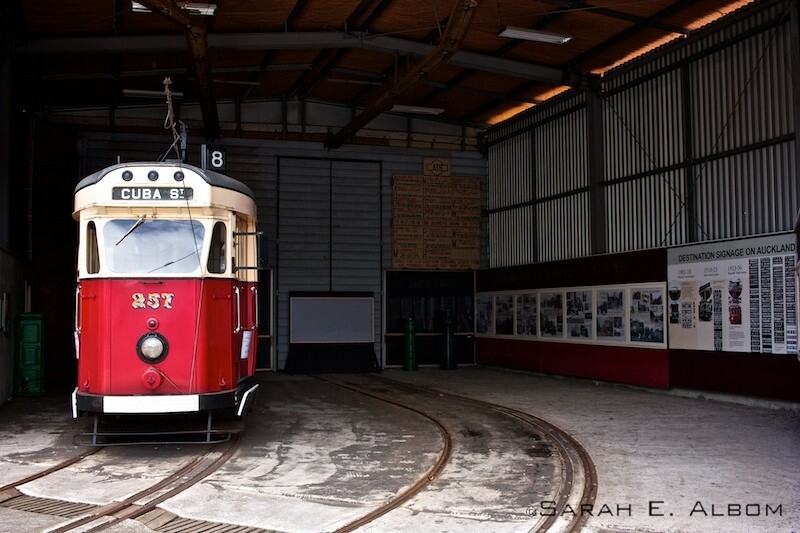 The entry fee includes both museums and the Western Springs tram that travels between the two. The aviation display hall brings history alive, often through recorded stories from the actual pilots. The planes are the real thing, refurbished to the point that most can fly. A few have been put on display to allow us to see their inner workings as well as their exterior. This plane has a hollow bone structure like a bird. The aviation display hall is educational and first class. Fighter planes, commercial planes, and dioramas built to scale all complimented by passionate volunteers who share stories and answer questions. There is even an area where New Zealanders can look up their family members to learn more about how they served the country. 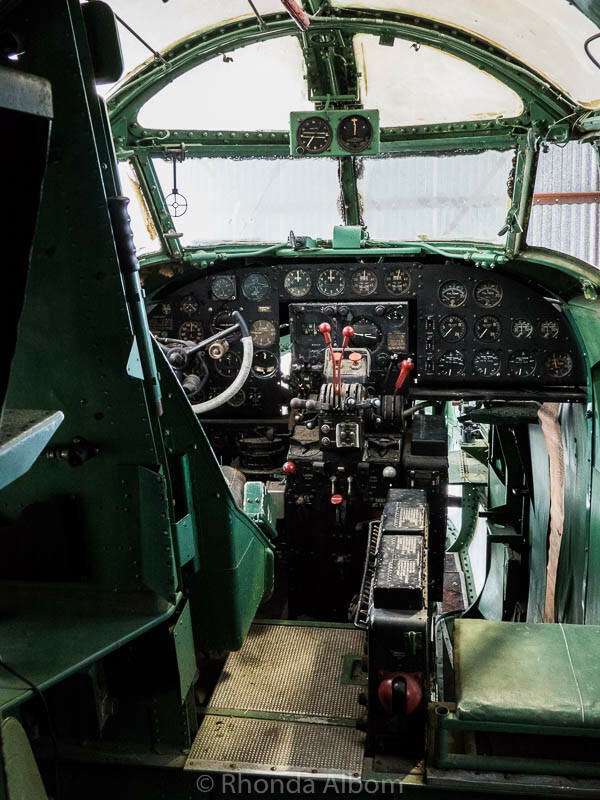 Interestingly, the wire controls used for steering the Tiger Moth biplane hanging near the entrance, use the same method that was developed by the Wright Brothers. The specific plane is yellow as that colour represents training missions. New Zealand pilots were responsible for training most of the pilots fighting for the Commonwealth. 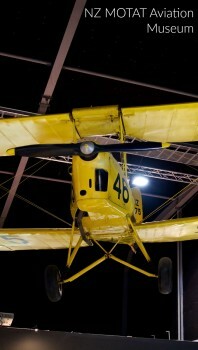 A fully restored 1938-39 Tiger Moth biplane. Next, we looked at one of the world’s few remaining Lancaster Bombers, a plane famous for “striking hard and fast.” A reliable machine with a reputation for achieving its target. It is bigger and faster than the comparable US B-17. The Lancaster was flown at night and had a groundbreaking radar system. Like many planes on display here, it took 40-50,000 man-hours to restore. 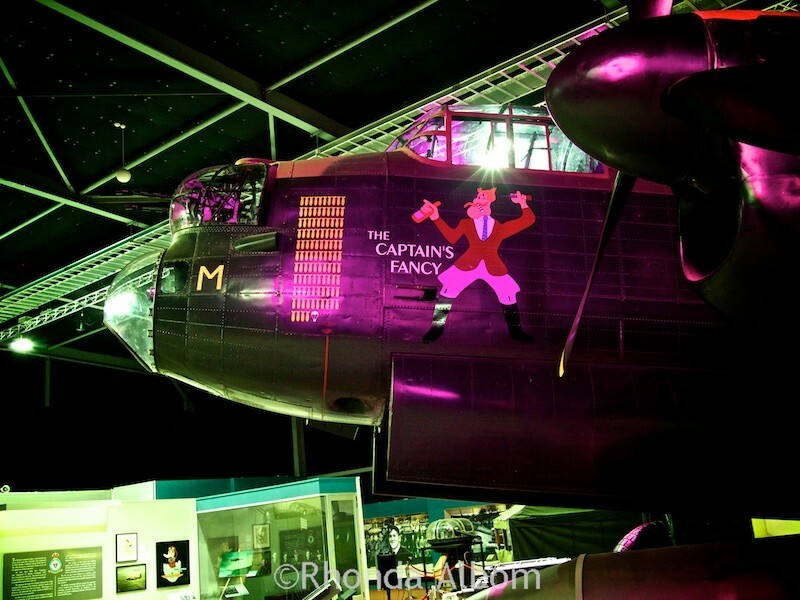 Each bomb painted on the side of the Lancaster represents a mission the plane flew. The parachute represents the final mission. Pilots could retire after 30 missions. New Zealand pilots (like the one who flew this particular plane) were famous for continuing on and doing what it took to defeat Germany. 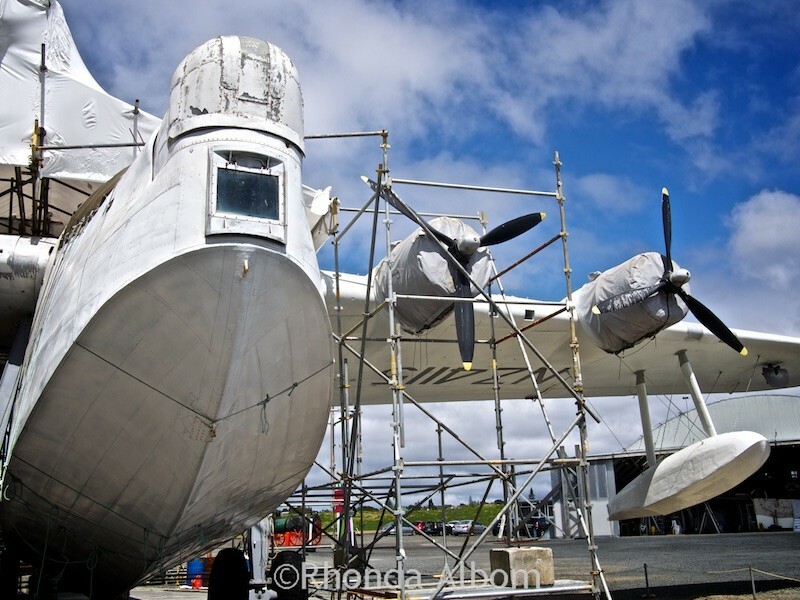 Below is one of only three Solent Class Mark IV Flying Boats (no wheels) remaining in the world. A second one is being refurbished in the work area behind this portion of the museum. These Flying Boats were a commercial plane used to cross the Tasman Sea. It’s not just the planes, it’s the people that make this visit so unique. 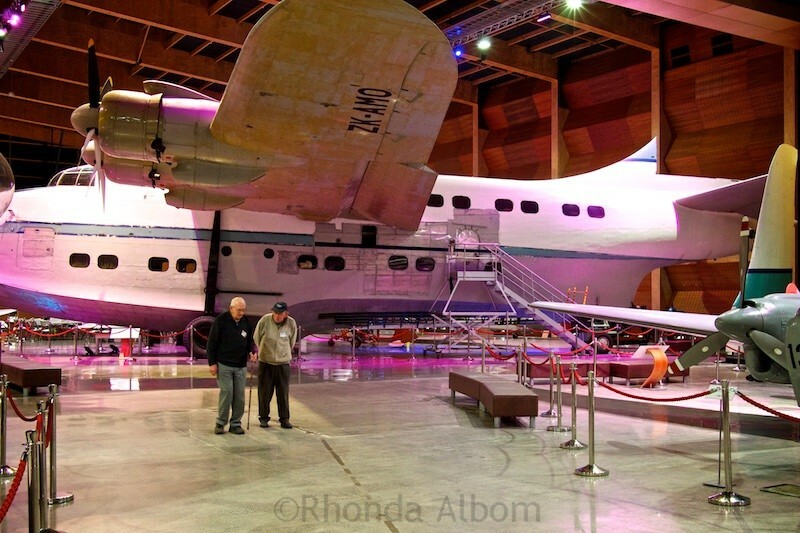 In the indoor photo of the flying boat, the two men in the foreground are Wally Halliwell and Alan Taylor, both RNZAF bomber veterans from World War II. Solent Class Mark IV Flying Boats. The working exhibits are out back. Here we found a second Solent Class Mark IV Flying Boat. Norm McKelvie, the last surviving Lancaster squadron commander is on the team restoring this airframe. A Solent Class Mark IV Flying Boat being restored. In the photo background is a 1944 RNZAF original hanger. The third Sunday of most months is MOTAT Live day at both museum locations. 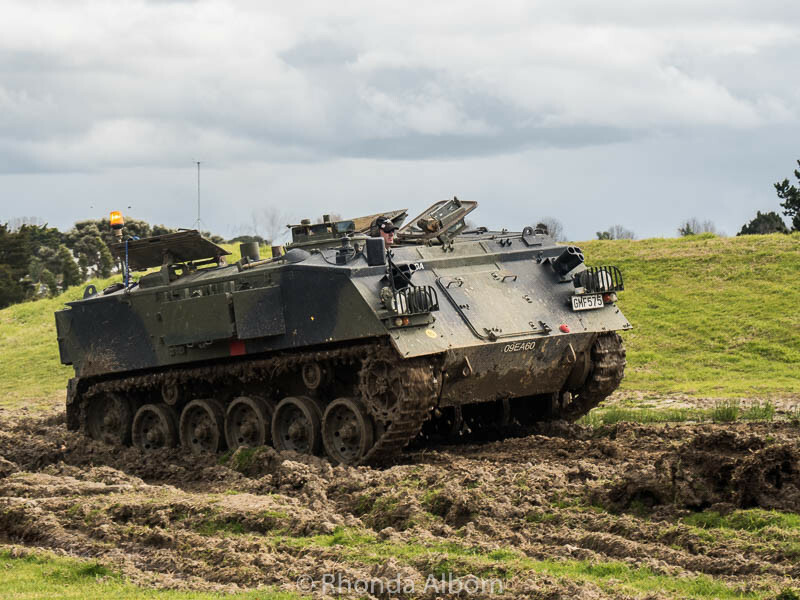 Aside from enjoying the aircraft normally on display, we also had Live Day opportunities to ride on a steam train, examine and ride on a military armoured personnel carrier (APC), and peek into the restoration workshops where volunteers restore a wide variety of planes to their original appearance. Restoration viewing is done from outside the hangar, which is generally closed (open for live days and other special events). The steam locomotive comes around the corner to pick us up from the “station” and bring us back to the museum. It is a short ride or an even shorter walk. (The steam train only runs on MOTAT Live Day). 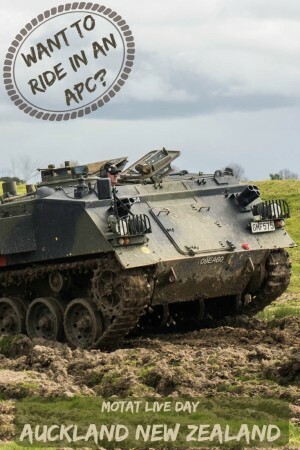 There was an opportunity for visitors to ride in this military armoured personnel carrier (APC). Being neither fond of enclosed spaces, bumpy rides, or the smell of diesel fumes, I opted to take photos from outside the APC while the rest of my family joined about 15 other visitors for a ride in this military transport vehicle. This is a Ventura, a World War II plane. More specifically it is the Lockheed RB-34-VE Lexington Mk 2 (PV-1 Ventura) NZ4600. While not generally open to the public, we were lucky to be allowed on the Ventura. We took the tram to the main museum. 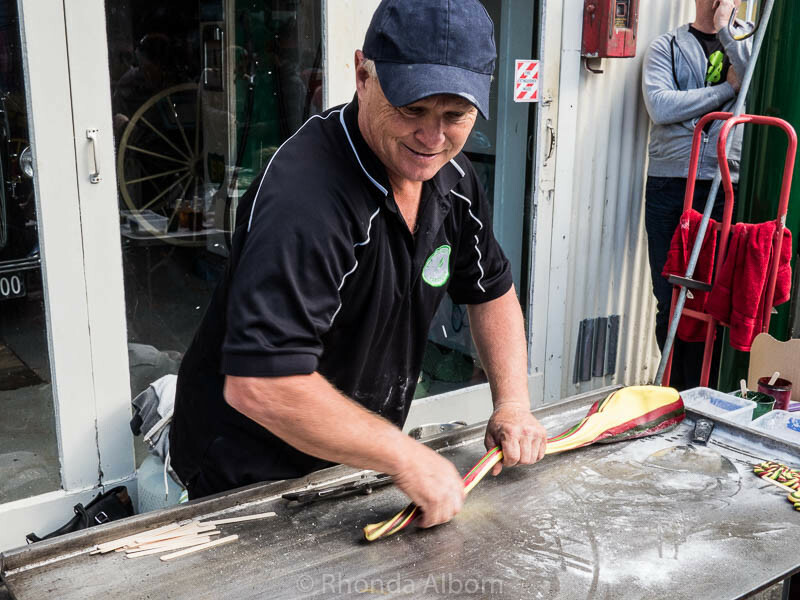 Some of the live day activities include a horse and carriage ride, candy making demonstration, Penny Farthing rider, printing press workshop demonstrations, road transport and tram workshops, a blacksmith working in the forge, and the pump house was in operation. Lolly (candy) making is popular with the kids. There are both demonstrations and an opportunity to make your own. 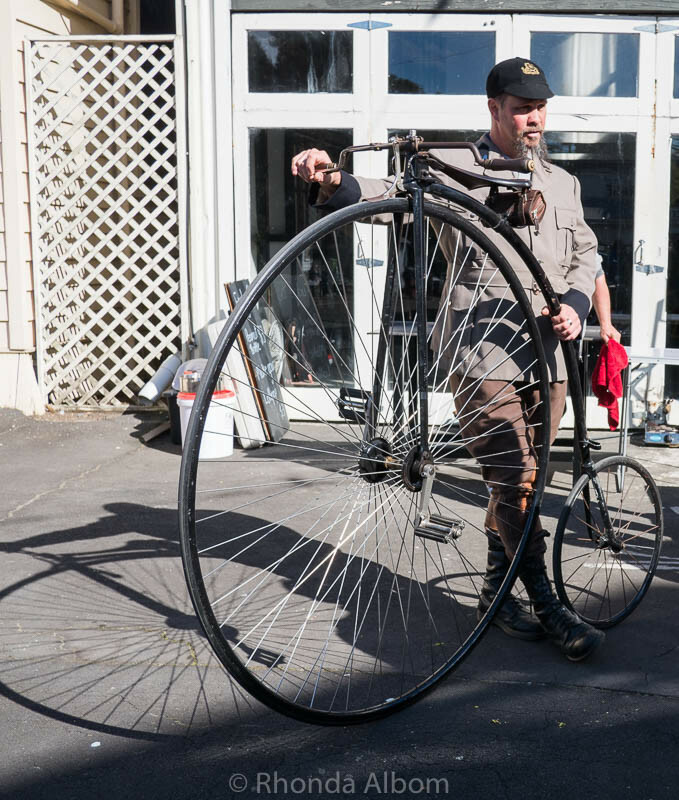 We saw this Penny Farthing rider pass by several times before we had a chance to talk to him. He explained the benefits of it over modern bicycles. A tram takes visitors between MOTAT’s two locations. It also stops at the Auckland Zoo. 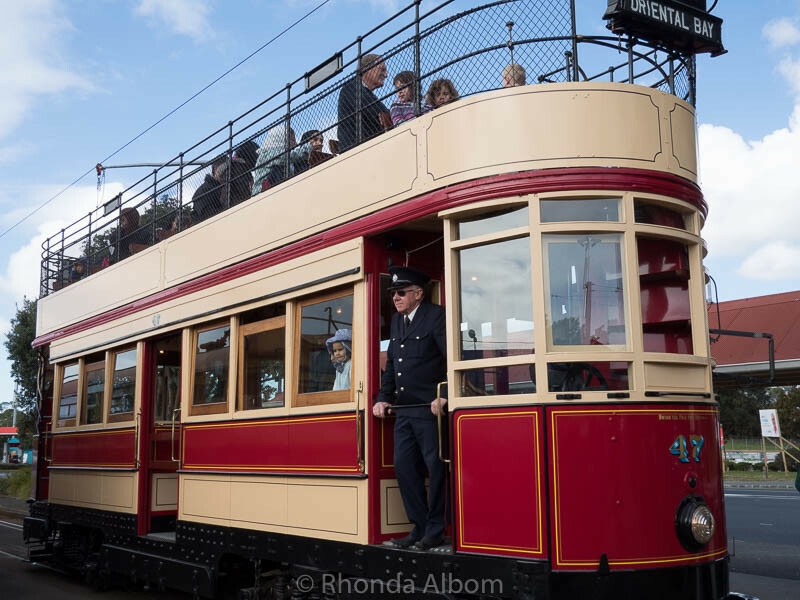 On MOTAT Live Day they bring out the double-decker ‘Big Ben’ tram, as well as another heritage tram (weather dependent). We rode on both, one in each direction. To be honest, the upper deck benches are small and not too comfortable, but it was fun anyway. MOTAT has evening events throughout the year. Some on holidays, others just for fun. An annual event loaded with frightful fun, the museum comes to life in a new way. While it is mostly a family-friendly event, there is generally one building restricted to 18+. Each year has a different theme. Two of my favourites were the Danse Macabre and the A Twisted Victorian Tale. 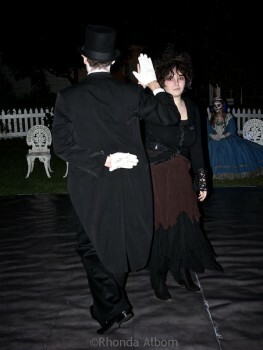 Guests were invited to join into the Danse Macabre (Dance of Death). Leading up to Christmas, MOTAT has an annual evening Christmas lights display, with proceeds going to a children’s charity. It’s a super popular event and my best advice is to get there early. I am fairly sure that this is not the real Santa Clause. The seven stars of Matariki are the inspiration behind Night Lights, a bright and colourful annual event at MOTAT Auckland. Matariki is the Māori name for the cluster of stars also known as the Pleiades. The seven stars of Matariki rise in late May or early June, marking the start of the Maori New Year. “Night Lights” is more than just a New Year’s celebration; it’s also a recognition of New Zealand, its artists, and their creativity. 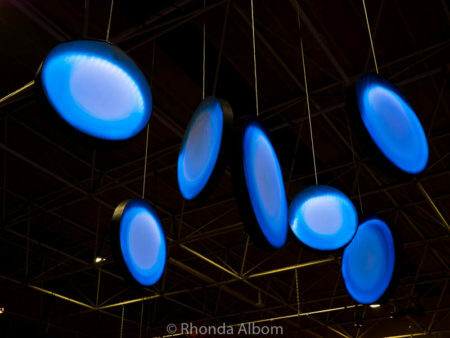 An interpretation of the seven stars of Matariki by contemporary New Zealand artist, Larisse Hall. The main MOTAT museum is located at 805 Great North Road in Auckland. The MOTAT Aviation Display Hall is about 2.5 km away on Meola Rd. They both sit on the edge of the Western Springs Lakeside Park in Auckland New Zealand. The Western Springs tram transports visitors between the two locations. MOTAT parking is generally easier at the Aviation Hall. MOTAT is a stop on the Auckland Hop-On Hop-Off Bus. 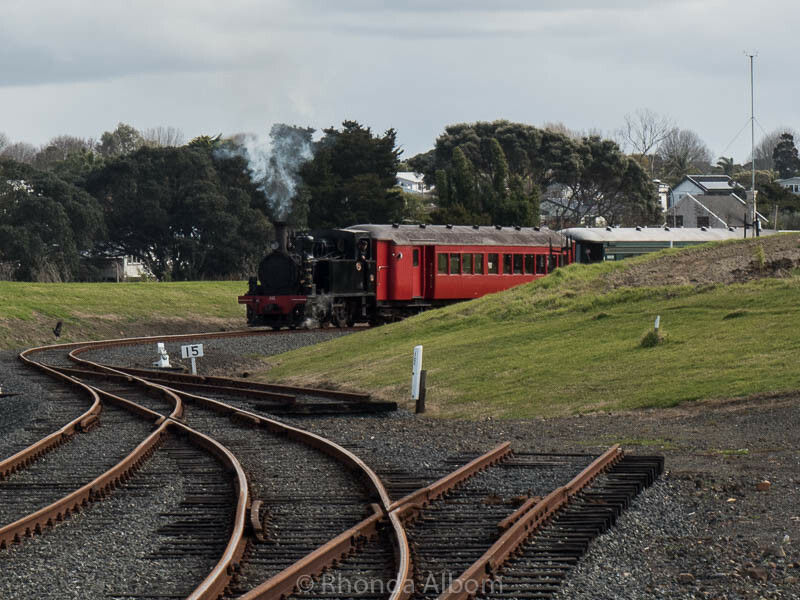 If you are visiting Auckland without your own vehicle, it is a great way to get to the museum and many other sites. There is a cafe offering a nice variety including gluten-free, vegetarian selections, and a decent cup of coffee. On Wednesday mornings (at the Aviation Hall), one can book to meet and chat with one of the veteran pilots or aviation engineers from actual missions. More information on MOTAT’s official website. Have you been to MOTAT Auckland? Do you prefer interactive or visual museums? 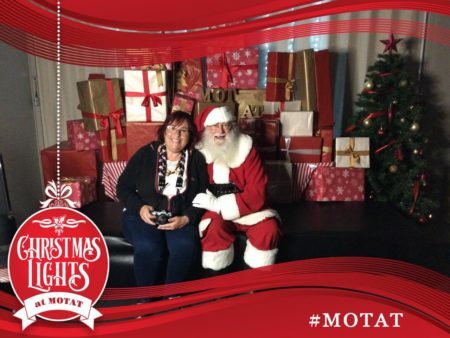 Disclaimer: I was a guest of MOTAT for all events above. However, the opinions expressed here are strictly my own. Hahah gotta love that selfie projection circular thing-a-thing there. Can’t have enough selfies! MOTAT seems like a great museum for kids of all ages. Even “kids” like my husband would enjoy it a lot. Isn’t it fun to revisit places that you used to take your kids to? We have so many great museums here in Los Angeles too, but since my son is grown up now I don’t feel like going there anymore. Your post however reopened my interest for my own city. My husband loved it too. Yes, Sarah is quite creative. Love to see all those interesting objects in the museum.. I pretty much enjoy the visual museum but my kids love the interactive ones. But both are enjoyable .. I tend to like to look at the more artistic things, but when it comes to the science, I prefer hands on. LOL – Time travel would be easy to imagine here. Another thing to add to my growing list of reasons to return to Auckland. The walk-on piano sounds like so much fun. It’s a small piano (in terms of the number of huge keys), but it was loads of fun. You just need to remove shoes to use it. Great post, we have a similar place here in Melbourne but not nearly as big. That place seems enormous. I’m sure my kids would love it if we visit Auckland I will put it on my list. 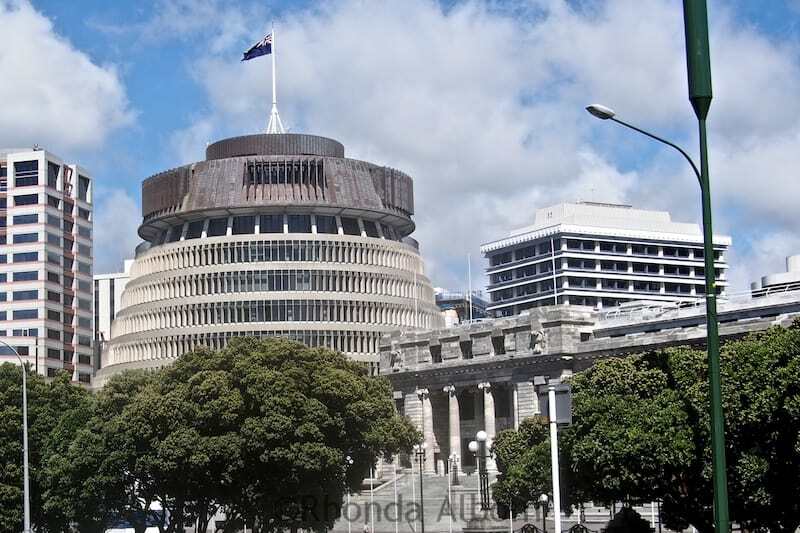 It is big for New Zealand, but I am not sure that you will find it big coming from Melbourne. This museum sounds and looks amazing, I am sure it would be a great place to visit. BTW Your shots are really good. Magnificent post, the museum looks very interesting, so many things to see and photograph! It is loaded with interesting things. There was plenty we missed too. We visted one in Queensland Aus recently. 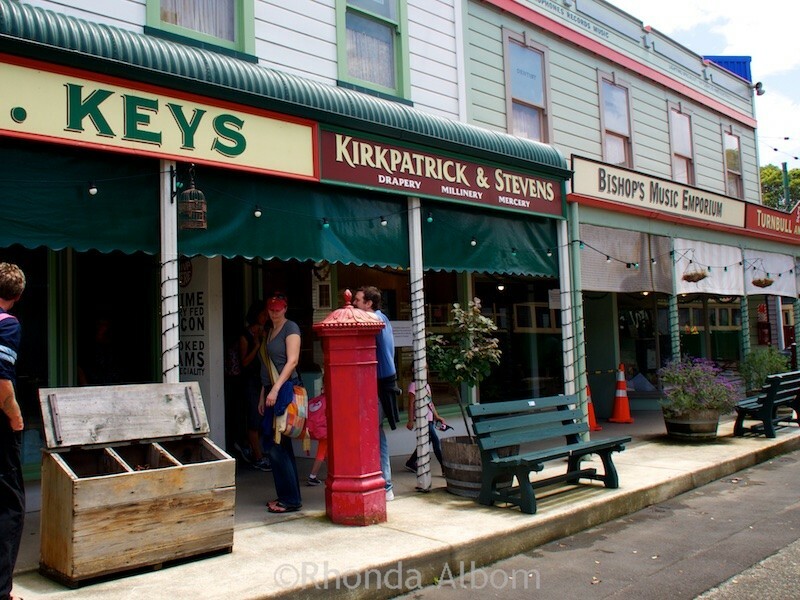 If I ever Aukland, I am using your blog as a guide. 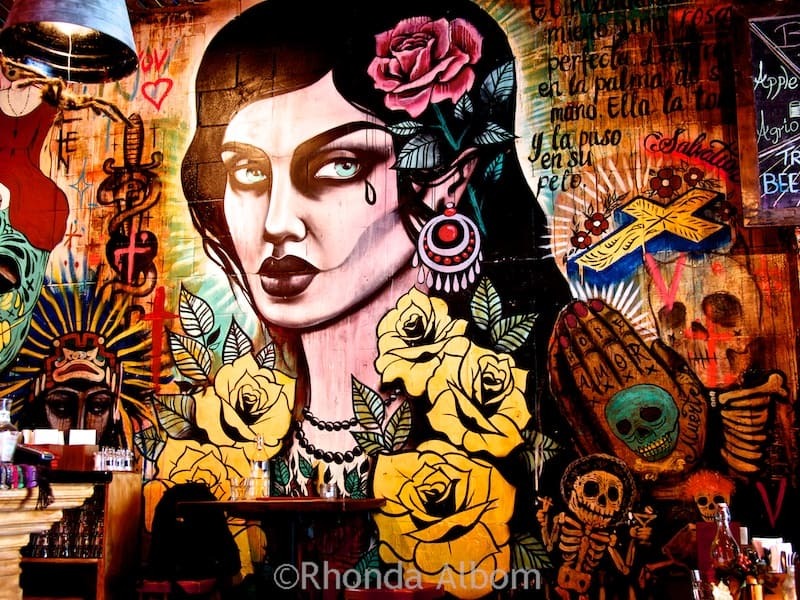 Too many cool place to see! Wonderful. I like to think that it is a useful tool. What a cool place to visit. I know it would be a hit with my 5 year old boy! He would adore the tram ride. If you go on one of the live days there are other tram and horse and carriage rides too. What a cool place to explore. Great for photos. I wonder how many left handed kids were traumatized by that rule? When we first walked into the school house it was empty, so the Pippins took seats and I went up front. By the time I got to the left hand rule, the room was filling up. There were 3 kids in there who were left handed and all quite surprised by this rule. LOL – It does make me feel a bit old, that and being older than the nana of one of the girls. It really is interesting, for kids and adults too. I hadn’t been in at least five years, possibly longer, and it has changed quite a bit. One room not featured here as it didn’t photograph too interestingly had all of the old hands-on science exhibits that were the centrepiece when we first visited 12 years ago. You do the funnest stuff! Yes, I know funnest isn’t a word but it seemed appropriate! LOL – funnest is the superlative adjective form of fun. It is a perfect word for most of the things I blog about. Oh how fun. I want to go. This would be a ton of fun to do. 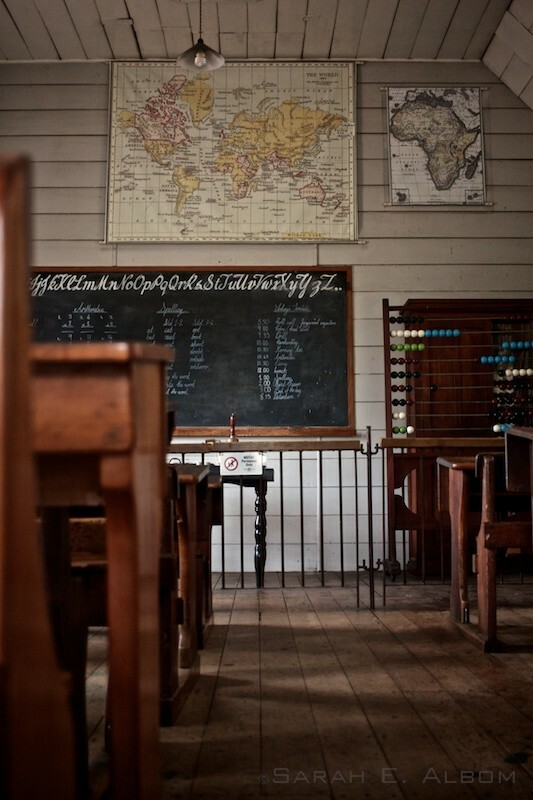 Loved the old school room and all that beautiful cursive letters on the blackboard. I found the cursive interesting as well, but for a different reason. They don’t teach it in New Zealand these days, they have a form of connected writing that is much simpler, and not as pretty. I wonder how many New Zealand kids today can even read the cursive. Depending on the museum would be whether I like the interactive. Sometime I just like to take in all the sites. Your camera is working very nice, wonderful pictures. I love the city street with all the shops and the little house! The old village has always been one of my favorite sections in MOTAT.